Three Chicago women come together for the first time with only one thing in common. Their husbands had all been killed pulling off a dangerous robbery of a local crime gang, the Mannings. The gang, who were using this money to fund the leader's ascent to local political power that they repay within one month or they will come for them for repayment in one way or another. The wife of the leader of the gang Veronica finds his notebook which details her husband's next hit which could pay out $5million she enlists the wives of the other gang members to help. This leads to them learning how to deal with the uderbelly of the crime world their husband's lived in and hopefully survive before the Mannings take out their revenge. I really wanted to love this film and I did enjoy most of it. Steve McQueen, who was known for quite thoughtful dramas such as Hunger and the Oscar-winning 12 Years a Slave takes quite a departure with this film. The obvious comparison is with Martin Scorsese's The Departed and the ensemble aspect of this film works for the most part. Sadly, this is not as well executed as his Oscar-winning movie and despite the fact I enjoyed the movie for the most part once it finished I felt no reason to ever watch it again. My main issue with this film is that it feels a little listless at times, like the filmamker's don't know what they want to focus on and so there are random scenes which add very little to the film. We have random scenes featuring The Manning's psychopath enforcer played by Daniel Kaluuya. He is fantastic in this role, but his screen presence is maybe 10 minutes in total and could easily have been one of the best characters in the film, given more exposure. The three wives played by Viola Davis, Michelle Rodriguez and Elizabeth Debicki are fine in general and all three have their moments where ou can feel they own the screen. However, they are given so little to work with maybe if this had been a mini-series, like the original British (and later American) version, they would have been given more time to flesh out their characters. The rest of the ensemble cast, including Liam Neeson as Veronica's husband, Colin Farrell as the politician the Manning's are trying to defeat and his racist dad played by Robert Duvall all fall for the same fate. McQueen's flashy directing, throwing flashbacks at the film left right and centre to mess with the timeline instead just mess with the viewer. I watched and at times had to pause the film just so I could figure out what I was watching and more importantly, why. Sadly the latter was never really explained and the film felt more style over substance and thus a bit of a mess. I would have expected his followup to 12 Years a Slave to be something more like the work he was known for, the powerful dramas such as the wonderful Hunger, but instead this came off as a British director trying his best to create an American gangster and sadly coming off as nothing more than an imitation. Extras include Plotting The Heist: The Story which is a short look at the creation of the film and is fine in general, but doesn't make the film any better. As well as a Trailer, there is a pointless Gallery of pictures from the film. This is not the kind of film that would warrant ths kind of thing and I am wondering why they included it. It is a shame there is not a commentary as within the short documentary Steve McQueen and the co-writer Gillian Flynn sound like they have more to say about how the film was made, but sadly there isn't one. 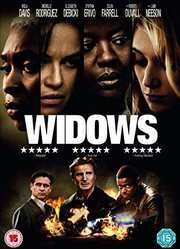 Widows could have been amazing and really should have been. The source material was strong to work from, the cast is amazing and the Director is one of the best working today. However, instead it felt like nothing worked in this film and what should have been a triumph is simply a whimper of a film that leaves no impression on myself. This is not a film I would recommend and certainly not one I would want to watch again.